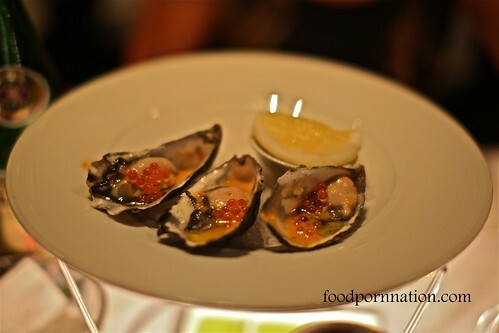 The oysters were just as delicious as I remembered, sweet morsels of plump oysters adorned with an acidic yet creamy tomato vinaigrette and salmon pearls. My first encounter with my beloved oysters left me feeling that I had experienced the best oysters in my entire life and on my return, still hands down, the best oysters ever. I need to get myself a shucking knife for home, I will then be more inclined to making some myself. By usurping Terry Durack’s famous catch phrase, this is “the one dish you must try” and I will add, “the one dish you must try in your lifetime“. 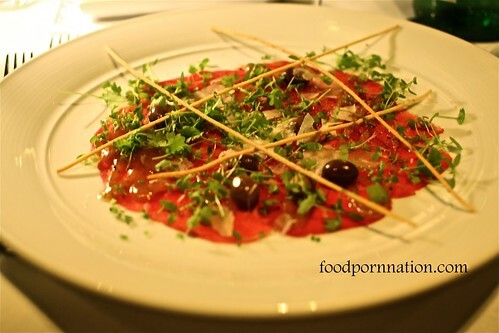 The beef carpaccio was beautifully presented with sweet painful artistry which had me at the crux of that bittersweet twang of barbarically ripping something so exquisitely apart. The beef was meaty yet velvety smooth where the thin delicate meat slivers simply melt inside your mouth and carry subtle fragrant notes of cheese and truffle. Brazil found it so tasty he said that it was, “F**king amazing… I think my mouth found its G spot!”. Compliments to the Chef, considering Brazil is sitting across from me at the dinner table and has publicly found his G in his mouth and he has only eaten his entree. I made sure I expressed Brazil’s sentiments to the wait staff which lead to some very interesting conversation. 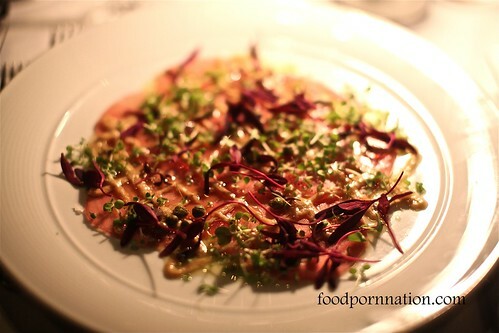 Admittedly the beef carpaccio was an extremely hard act to follow however, the ocean trout still maintained its inherent spark. The dish contained fresh and light spring flavours and was equally as exquisite to the eye. The tuna was delicate and slippery with the marinade coaxed around the fleshy pieces and the plate was drizzled with an eggy creamy mayonnaise and zesty lemon vinaigrette that had a touch of capers for an added extra bite. Another dish you simply can’t go past is the 3 cheese ravioli with burnt butter sage sauce. Simply stunning. You’ll find a creamy cheesy filling encased in delicate parcels that strikes the perfect balance of nutty burnt butter flavours with sage leaves that are wonderfully delicate, fragrant and positively dripping with the burnt butter sauce. The sage leaves whilst fragile are crispy as they are submersed into the butter cooking process and to close your mouth over the wispy sage leaves only crushes it into europhic meltdown. 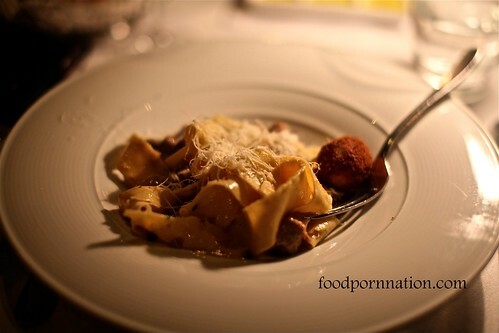 One of the specials of the night was the cabbage tagliatelle and wagyu beef with an infused tomato and rosemary ragu. 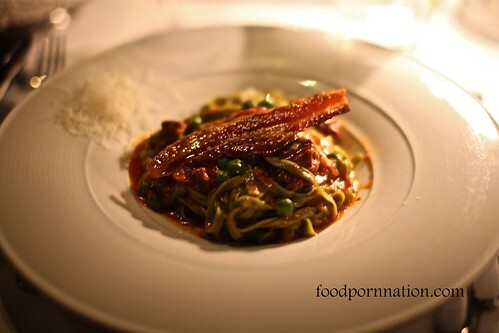 The tagliatelle was gorgeously thin and slippery however I found the beef ragu was a bit understated. Whilst pleasant, the ragu lacked the intensity and richness I was hoping for. While the thought of devouring veal sweatbreads would put anyone off. I always find them so delicious. Again the pasta here was silky smooth, the veal sweatbreads were delicious, tender, wobbly, fatty, little melt in your mouth heart attacks waiting to happen. 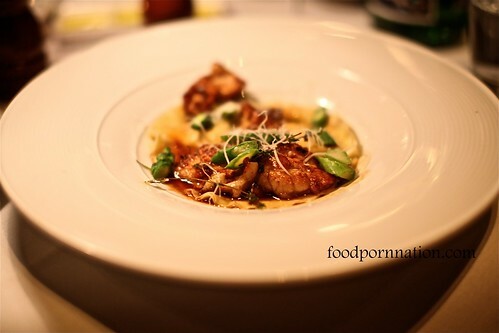 The dish was served with a rich and densely concentrated mushroom sauce. I personally found the combination a touch heavy with the sweatbreads but that may have been because I have had so much already! I wasn’t afraid of whiplash, so I slurped these fat silky papardelle bad boys into oblivion. It was a slippery sensation! And I loved every moment of it. The dish was dressed with soft veal chunks, a light coat of cream sauce and a bone marrow nugget to boot. Delicious-i-oso. 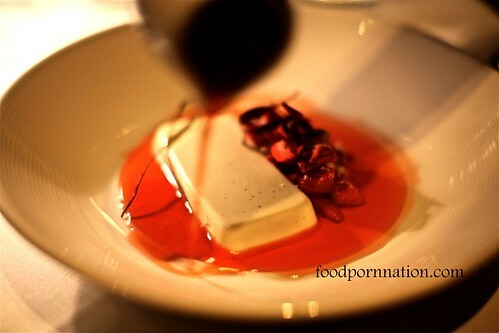 I am not normally a dessert person, I rarely enjoy it truth be told and yet, I thoroughly enjoyed every moment of the vanilla bean and goats curd bavarese. 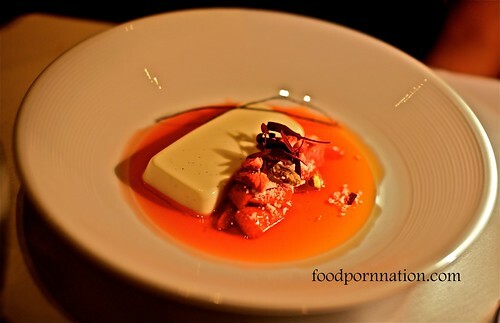 A wobbly gelatinous goats curd plank surrounded by a pool of strawberry consomme. It was light, creamy and had this wonderful tang right on the finish. And after all that pasta, it was a perfect, light and refreshing end to the night. After working our way through 4 courses, (mains at entree sizes, of course) Pendolino continues to be and has got to be one of my favourite Italian restaurants serving up the best pasta Sydney has to offer. Even though it took me a while to make a comeback, my first visit left such a deep impression around the quality and presentation of the food that I have always expressed my fondest feelings of this place to others in so as to “share the love”. Coming back, only serves to showcase the consistency, quality and little works of art that it continues to maintain and uphold. 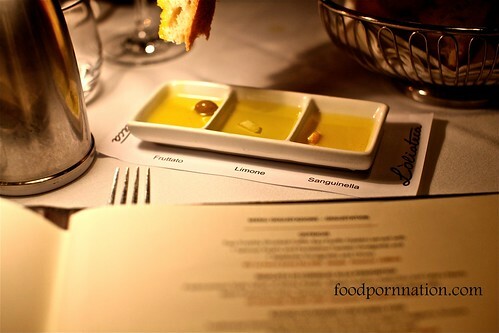 Pendolino promises outstanding pasta dishes prepared on premises with organic produce. If you are after a fantastic meal, sensational pasta or a lovely setting, you need to drop by and pay Pendolino a visit. Otherwise, you will live to regret the day that you didn’t. 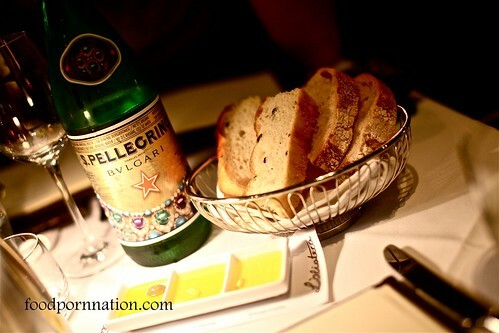 Welcome to Pendolino for Perfect Italiano. The pasta dishes all look great!! I must’ve walked past this restaurant several times before because the name sounds so familiar. You have to try it Tina because it tastes as amazing as it looks! It’s been over two years since I ate here but I remember it fondly. The pasta is fantastic and I loved the dessert from memory. the ravioli looks amazing but i still can’t wrap my head around the idea of sweetbreads. So funny that you should say that because I wasn’t entirely aware of what they were when I first had them. It was consumed under false pretences!! I only learned what they were until after I had eaten them. So it was a little too late. Still, it is v tasty if you can wrap your head around it or just block it out completely! Which is what I tend to do. Lol. The shot of the olive oil tastings is easily my biggest achilles’ heel of the lot. The Turkish Airlines lounge in Istanbul has a small, albeit occupied table of a few different olive oils to try, and why not, Turkey is close to the epicenter of the trade! I don’t need various fruits and pulses added to it; they aren’t bad, but IMO plain jane OO does it best, on a nice piece of whatever-the-hell is available. Living in East Asia, it certainly wasn’t too common an ingredient in daily cooking, so I’d haul the extra few kilometres just for a bottle. What’s your take? Although this is an Italian restaurant, does “contemporary” Sydneysider cuisine (ha) take advantage of it much? I am surprised you didn’t say the 3 cheese ravioli and the sage and burnt butter sauce. Every time I look at it, it’s enough to make me weep!